Jeffrey Joyce, Ph.D., vice president for research, recently had the honor of serving as a panelist during a Town Hall Forum hosted by U.S. Rep. Kevin Yoder in Overland Park, Kan. The forum, which took place Aug. 19, focused on the impact that research funded by the National Institutes of Health makes on the Kansas City area. The panel included individuals from NIH-funded institutions, local entrepreneurial companies and patients that are directly benefitting from NIH research. Dr. Joyce has 28 years of research experience, including 15 in administrative roles. He is an internationally known researcher and pharmaceutical consultant in central nervous system drug discovery, and his work has led to target development for drug discovery in both schizophrenia and Parkinson’s disease. At KCUMB, Dr. Joyce is tasked primarily with helping the University achieve its strategic goal of enhancing research activity. Along with Dr. Joyce, panelists included: Steve O’Connor, chief executive officer for ImpeDx Diagnostics, Inc.; Douglas Girod, M.D., executive vice chancellor of the University of Kansas Medical Center; Scott Weir, Pharm.D., Ph.D., director of the Institute for Advancing Medical Innovation at the University of Kansas; and Leesa Gabel, a cancer survivor and volunteer with the Livestrong Foundation. On Aug. 15, new College of Biosciences students had their first opportunity to help KCUMB fulfill its mission of “improving the well-being of the communities we serve.” Approximately 40 biomedical sciences students, along with two students in the one-year, stand-alone bioethics program, sorted donated food at Harvesters Community Food Network in Kansas City, Mo. Harvesters is a regional food bank serving a 26-county area of northwestern Missouri and northeastern Kansas. It provides food and related household products to more than 620 nonprofit agencies, including food pantries, homeless shelters, children’s homes and others. Along with the students, faculty and staff participants included Marshall Andersen, Ph.D., associate professor in the College of Biosciences; Julie Fountain, LMS administrator and instructional trainer in Information Technology; Britt Johnson, Ph.D., assistant professor of bioethics; and Deb Mitchell, administrative assistant in the Division of Social Medicine. View our photo gallery. 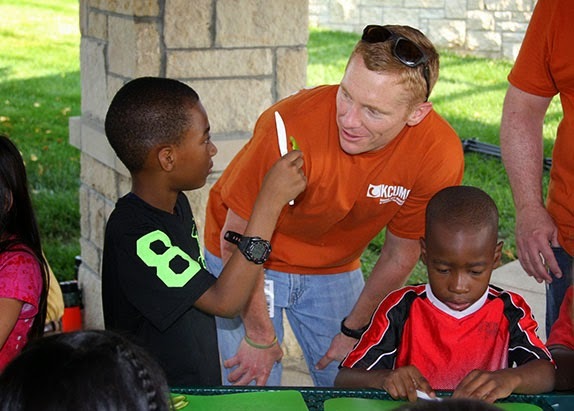 When members of KCUMB’s chapter of the Student American Academy of Osteopathy provided free physicals earlier this year for Boy Scouts, they knew they were helping boys who otherwise may not have been able to afford a doctor’s visit. The Boy Scouts in Troop 221 appreciated the free physicals they received in April, which meant they would be allowed to attend summer camp. Unfortunately, the troop’s vehicle was stolen in June – and inside it, all the required forms from the free physicals SAAO members had performed. While the vehicle was recovered, the forms were not. SAAO members quickly rallied volunteers for a second series of physicals, which they performed in time for the Boy Scouts to attend camp. This is a great example of how our students are making a difference in the community. I had the pleasure of meeting with Kelly Gillespie, executive director of the Missouri Biotechnology Association (MOBIO), on Aug. 11. I shared with him KCUMB’s commitment to advancing research as an institution and as a member of the Kansas City Area Life Sciences Institute. MOBIO is a nonprofit trade association composed of a broad cross-section of companies, institutions of higher education, research organizations and related firms involved in research, development and commercialization of the life sciences. MOBIO members promote economic development in Missouri by supporting life science research and practical applications that benefit the general population. The primary goal of MOBIO is to make new discoveries available to everyone. By working with groups such as MOBIO, we at KCUMB can help transform not only our own institution, but all of Kansas City into a hub for life sciences research. In July 2013, we unveiled a comprehensive, five-year Campus Master Plan designed to both identify needed facilities upgrades and create a state-of-the-art medical and health sciences campus for the future. As part of that plan, extensive renovations will soon begin on our Administration Building, which served as the original home for Kansas City’s Children’s Mercy Hospital. Before the renovations got underway, we invited some of those affiliated with Children’s Mercy Hospital to tour the building and tell us more about its history. It was fascinating to learn more about our Administration Building's past, such as when Babe Ruth and Lou Gehrig stopped by to visit hospitalized children, and to share with them our plans for its future. Read more about it in the Kansas City Business Journal. Faculty, staff, students and community leaders gathered Aug. 2 for a special ribbon-cutting ceremony marking the official opening of our new Academic Center. The Academic Center, nestled between the D’Angelo Library and the Student Activities Center, is a state-of-the-art facility housing two large lecture halls, as well as rooms for smaller breakout sessions and training. It is the start of KCUMB’s five-year, $60 million Campus Master Plan, which will create a state-of-the-art medical and health sciences campus for the future. View our photo gallery. The Academic Center is the first of several initiatives to improve our campus and realize KCUMB’s vision to become the most student-focused medical university in the nation. It is one of many steps we are taking to improve our campus, provide our students with the best training facilities, and make a visible and significant commitment to our Northeast Neighborhood. 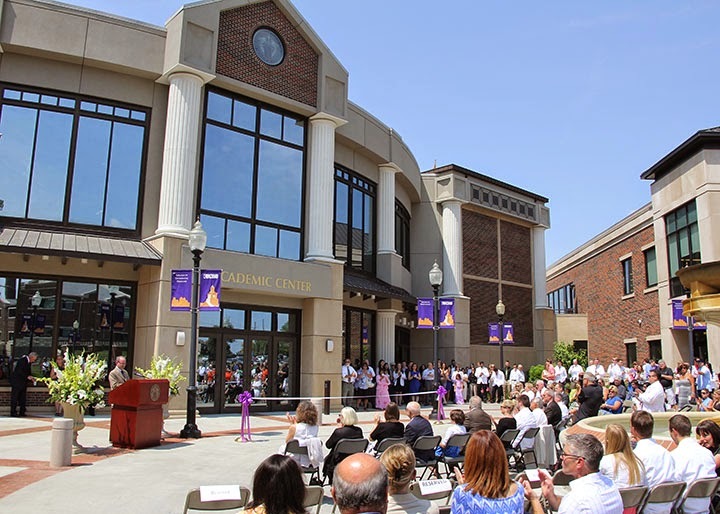 By renovating the former Weaver Auditorium space, KCUMB was able to complete the Academic Center for approximately $4 million less than the cost of new construction. A wall in the Academic Center will soon recognize donors to the building, and plaques from the original Weaver Auditorium seating are now affixed to students’ desks in the Academic Center. In addition, 93 percent of the materials used in the original building were repurposed to ensure minimal waste was sent to landfills. Helix Architecture and Design, along with general contractor McCown Gordon, accomplished sustainability goals by sending original auditorium seats to other academic institutions, recycling wood for use throughout the building and reclaiming other building materials. As a result of these efforts, the Academic Center is poised to become KCUMB’s first LEED-certified building. LEED, or Leadership in Energy and Environmental Design, is a green building certification program that recognizes best-in-class building strategies and practices, based upon four levels of certification. KCUMB has submitted the documentation necessary to apply for a LEED Silver rating. For more information or to see progress on other portions of the Campus Master Plan, visit www.kcumb.edu/Future. 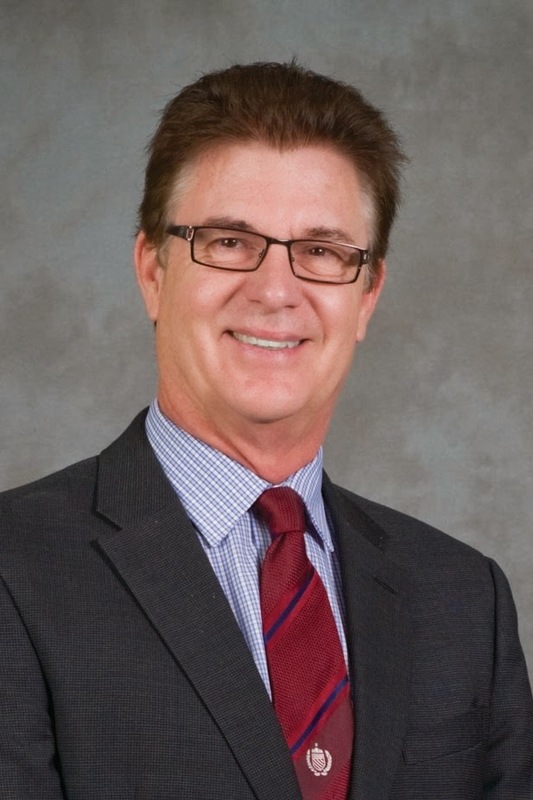 Please join me in congratulating Robert White, Ph.D., professor of molecular biology and medical genetics, on recently being named as the new dean of KCUMB’s College of Biosciences. 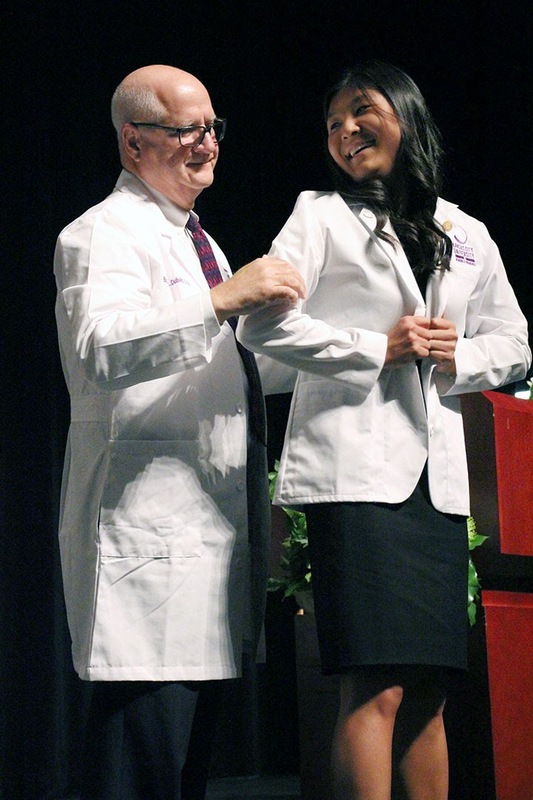 Dr. White had served as associate dean for the College of Biosciences since 2012. He replaces Douglas Rushing, Ph.D., who stepped down as dean of the College of Biosciences on June 30. Dr. Rushing remains a full-time professor of biochemistry at KCUMB through the end of 2014. At that time, he will transition to a part-time role, with his primary responsibility being his work overseeing the University’s recently formed strategic leadership teams. Dr. White trained at The Jackson Laboratory at Boston College, where he earned a doctoral degree in biology. He completed a postdoctoral fellowship at Harvard Medical School and Children’s Hospital in Boston. 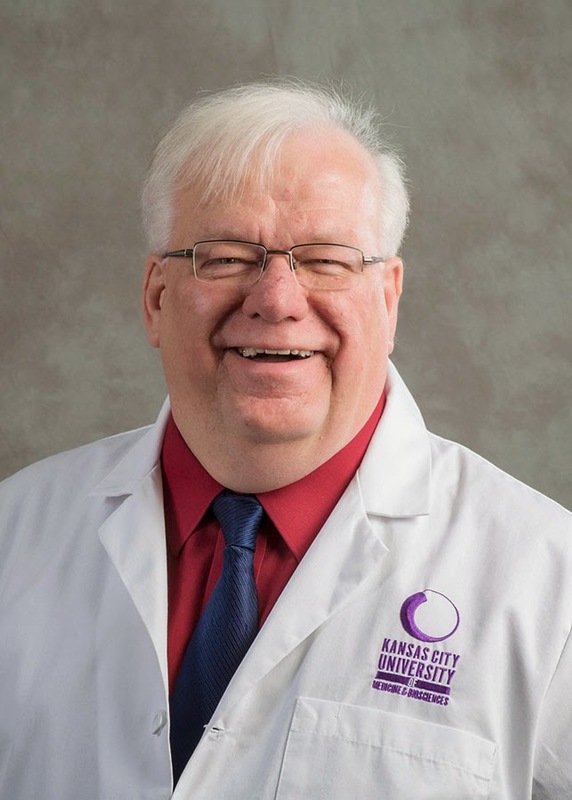 Before coming to KCUMB in 2010, he served as the director of the Mouse Genetics Research Laboratory at Children’s Mercy Hospital for 17 years. Dr. White is the author of more than 80 publications in peer-reviewed journals, including the New England Journal of Medicine, Blood, Genomics, Proceedings of the National Academy of Sciences USA and Nature Genetics. He has been the recipient of several extramural grants, including a large grant from the March of Dimes. He was also the recipient of the Kansas City Science Pioneer Award from the March of Dimes in 2004. We look forward to continuing to grow our College of Biosciences programs with Dr. White’s leadership.